Bali is famous as one of the best tourist destinations in the world. Not only have natural tourist attractions and culture course, Bali now adds a new tourist destination for the tourists. Shell Museum or the Museum of shells. This seashell Museum is the only museum of shells in Indonesia. As the name suggests it has a seashell Museum architecture design buildings that resemble the shells of clams. Inside the building, there are a lot of collections of objects that can certainly increase Your insight into the visitors. This place fits in well as holiday location for children. Visitors can enjoy various types of museum collections such as shells and hundreds of million years old fossils from various countries. It's amazing, isn't it? because the fossils and shells-shells is very old, the need for treatment and care of a conscientious and consistent so as not to damage. Thanks to the consistent care, a collection of fossils and shells that are between 100-150 million years ago continues to look like the original shape while still alive. Seashell Museum consists of three floors. Every floor in the building, the museum offers a collection of different types. On the 2nd floor, for example, there is a collection of shells that are very unique form that is very similar to the squid. The fossil shells similar to squid is expected to age more than 400 million years. There are other unique seashell fossil. such as a fossil shells are shaped much like a plant with flowers. This is called clam fossil Crinoid. This Crinoid fossils are also very old age of the 440 million years ago. Another unique collection that you can find on the 2nd floor of the seashell Museum fossil Crinois. Crinois is the greatest fossils in the world. Let's go up to the 3rd floor. On the 3rd floor, you can find a variety of collections that are not less unique. For Example, Cypraea Teodoro Moneta. Collection of shells on this one is just a means of payment in money function like alias times now. Curious with the museum? This seashell Museum buildings are equipped with home theater system home theater where it describes the process of the discovery of the fossils are now stored in the museum. So you and other visitors can get to know the difficulty of digging these oysters fossils. 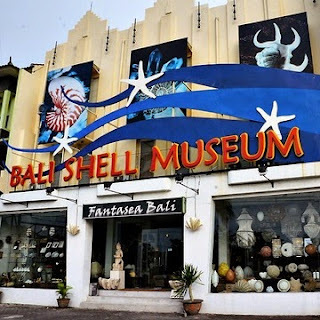 For those of you who would like to visit this seashell Museum, please visit The Sunset Road in the town of Kuta, Bali. The museum is located about 10 km from Bali's Capital, Denpasar. You can walk away from the city of Denpasar towards the museum. Distance fare is just 15 minutes away on foot. Or for those of you who do not want to walk, you can rent a motorbike to get to the location of this unique museum and educational.